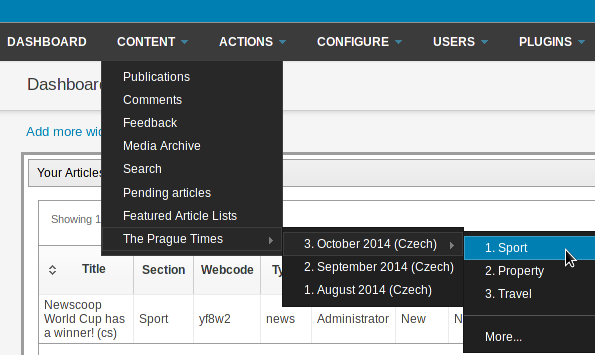 The main Newscoop menu contains a link to the Dashboard page and up to five sub-menus, depending on the permissions of the user who is logged in. These sub-menus are Content, Actions, Configure, Users, and Plugins. The menus shown below are for an administrator user, who has access to all sub-menu options. Here you can find the Publications on the server, reader Comments, Feedback messages, the Media Archive, and the Search page for all of the articles in the Newscoop database. You can also find links to display Pending articles and Featured Article Lists. You can read about these menu functions in detail, in the following chapters of this book. For each available publication, there are quick links to the latest three issues on a sub-menu, and a full list of sections within each issue on further sub-menus. This menu provides quick access to the most commonly used functions, including Add new article and Edit your password. It is also the place to find the Import XML and Backup/Restore features. On the Configure menu you can adjust the System Preferences for your publication, and perform a number of other functions described in the Newscoop administration section of this book. Themes are the template packages which determine how Newscoop displays content to your readers. Article Types describe the format of your articles, while Topics allow you to categorize your articles. The Languages option specifies the languages that journalists have to choose from when creating articles. Countries enables you to specify the name of a country in the local language for each territory. Clicking Logs will show you the recent activity of all staff users, for auditing purposes. Support enables you to set whether details of your server can be sent back to Sourcefabric, in order to assist support engineers. 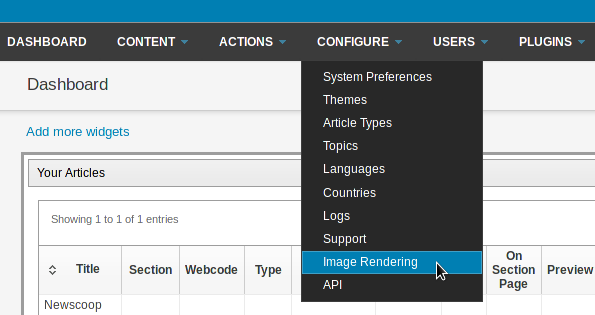 Image Rendering enables you to set cropping sizes for different types of images in your publication, and API enables you to configure the Newscoop Application Programming Interface for third-party applications. Here you can Manage Users of your website, and Manage Authors. You can also Manage User Types, or Create a new account. The Manage Authors page enables you to maintain contact and biographical information for each of your publication's contributors, as well as track the articles that they have worked on. 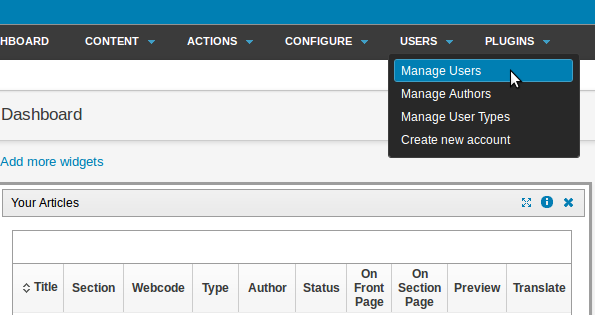 The Manage Authors page is separate from the Manage Users page so that contributors can be managed even if they do not have a Newscoop login account. This sub-menu provides access to additional functionality for Newscoop, which might include one or more of the plugins available at https://github.com/newscoop/ for download. See the chapters Installing plugins and Using plugins for details. Up in the top right corner of the administration interface are two additional links, to the right of the full name associated with your login account. Help links you to the on-line version of this manual, via the Sourcefabric website, and other support resources including Newscoop forums. Logout ends your session and returns you to the administration login page.